disclaimer: I was invited to a media dinner at Patty Mac’s. It’s been quite a long time since I’ve been in, as in actually inside, Adelaide Casino. When I was at uni, my friends and I used to go there quite a bit. Firstly, there was the excitement of actually being allowed in (I was the liability who was ALWAYS asked for ID, so I usually had to go in last …) and secondly, at some point, a mate and I figured out that the cheapest, and best, wedges with sour cream and sweet chilli sauce were to be found there. More recently … Sean’s Kitchen and Madame Hanoi – absolutely I’ve been there – but actually inside the Casino … nope, not for ages. So, on a hot Tuesday night, venturing into the Casino to check out the new restaurant, Patty Mac’s, was a whole new adventure in itself. I entered off North Terrace and Patty Mac’s is easy to find – straight up the stairs (OK, past a few glittering poker machines with their distinctive plink-plonk noise). The restaurant is housed in what used to be the station’s conductors’ office. It’s now a bright, light space (and very well airconditioned!). While the interior is by Studio Gram, it’s a lot more toned down (perhaps by that I mean ‘less distinctively Studio Gram’!) than many of their other Adelaide venues. It’s 1950s American diner chic: clean lines, chequerboard floor, and diner quotes adorn the walls. The menu follows suit – it’s short and sweet but laden with quick, comfort-style dishes, with burgers and hot dogs taking pride of place. We were treated to a selection of sides and quick specials and then our choice of burger. 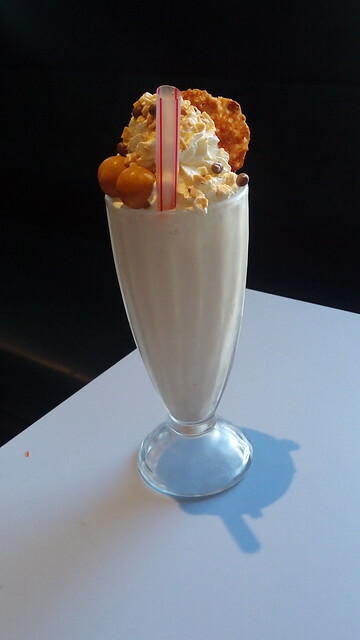 Anyone with space could also sample a milkshake and we wrapped up with the chocolate cherry pie. The restaurant’s strapline is ‘there’s always room for pie’ … this may not be entirely true. 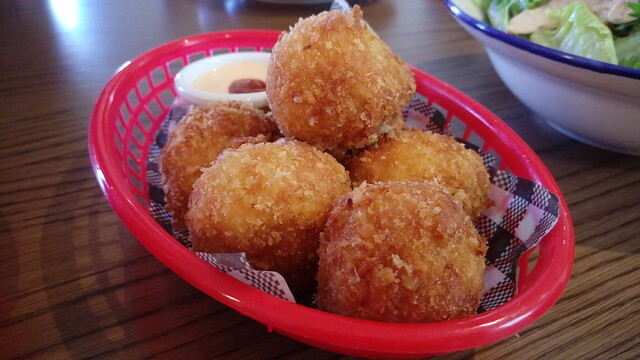 Our shared starters were the ‘Balls of Fire’ (mac and cheese balls, with a really tasty Sriracha-ranch dressing – these just edged the wings as my pick), the buffalo wings (maintaining their crispiness despite the clever sweet-sour-spicy marinade and sauce), the Cobb salad and the apple slaw. 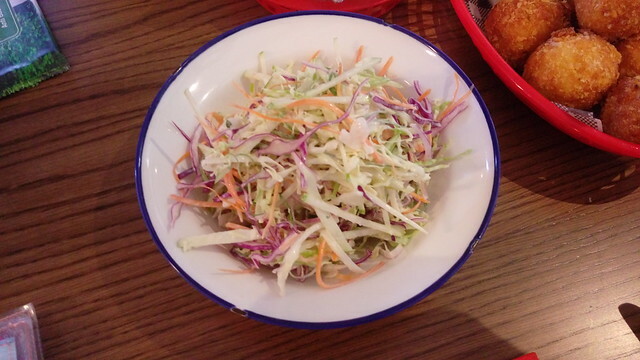 Both of the salads were great – despite the Cobb being loaded with things like blue cheese and avocado, it still felt really light, with soft juicy chicken rounding it out, and the slaw was very fresh and crisp and not bogged down by a ton of dressing. 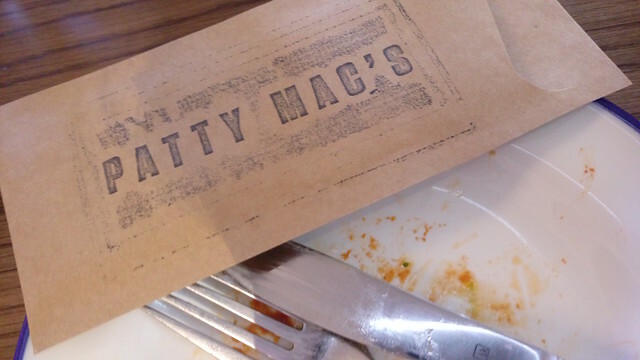 I’m pretty picky about salad – too often venues drown salads in dressing, so Patty Mac’s gets a big tick from me on this one. 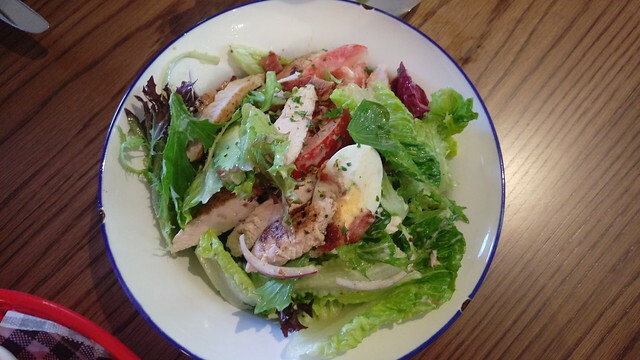 If you were hungry, the Cobb salad would work a treat as a light lunch. 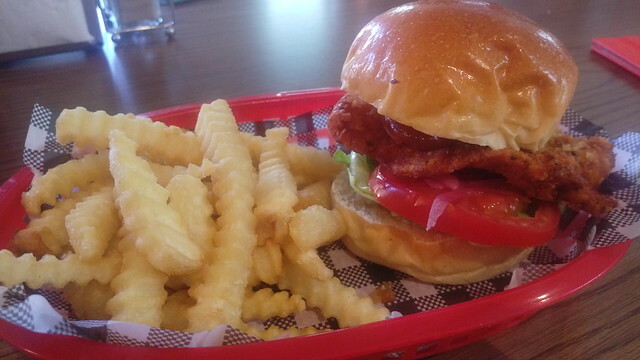 Burger-wise, I chose the Southern Fried Chicken burger – topped with fried chicken, lettuce, tomato and a really tart and crisp red onion pickle. Obviously, chips are on the side. I was particularly pleased that the burger bun was neither falling apart nor soggy – top marks there. We finished with the chocolate cherry pie. The kitchen brought out the whole pies to the table – they are normally served in wedges with whipped cream. I was pretty full by this point so requested I knife so I could have a slightly smaller portion. After that … I was fully full! 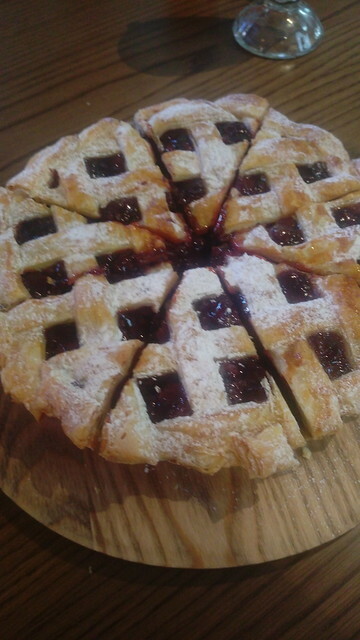 The chocolate and cherry pie was delicious – but really ever so rich. Perhaps go easy on the savoury dishes (or duck in for a coffee and pie mid-afternoon …). So it goes without saying that I didn’t try a shake (sorry, but I took a picture of one). I can imagine children would go MAD for the shakes so, from that point of view, it’s a real shame that the restaurant is inside the Casino and off-limits for anyone under 18. John, the Casino’s sous chef, stepped out of the kitchen to give us a few insights into the menu and the day-to-day functioning of the Casino. 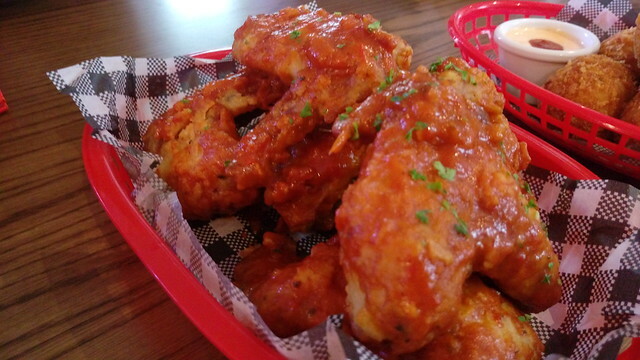 The aim at Patty Mac’s is to produce food that can come to the table quickly. With one eye on the football season (and I guess the Festival and Fringe will have given them a good trial run) the idea is to feed the hungry quickly. Even though the brigade is small the menu has been planned around this. He wasn’t giving away any recipe secrets (unsurprisingly) – so you will just have to go and check the food out for yourself. However, for a fun fact, he did say that the Casino turns out over 700 (SEVEN HUNDRED) covers a day on internal meals alone. 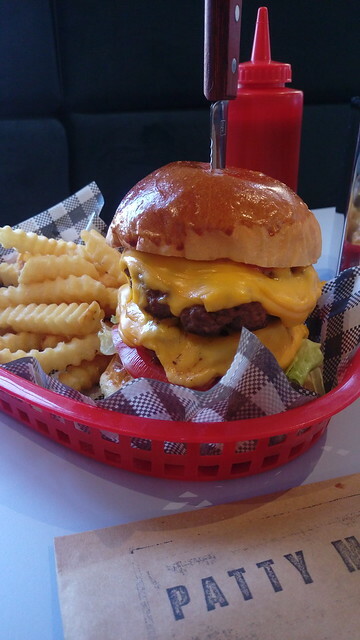 Since dining at Patty Mac’s I’ve shown a few friends pictures of the burgers and they always get the same response (ooohs, aaahs). If you love a burger, Patty Mac’s is one place you should definitely check out.